On any given morning, SOIL’s current depot in Cap Haitien is abuzz with EkoLakay collection vehicles coming in and out from the communities we serve, staff briefing one another on the activities of the coming day, and buckets of bonzodè (the carbon cover material used to “flush” EkoLakay composting toilets) being stacked along the walls in preparation to be delivered to families’ homes. This depot serves as a hub between SOIL’s primary office, staff in the field, and our composting site out of the city. Photo of the construction of the new depot in Ti Lary by Vic Hinterlang. While the energy in the depot is contagious, as SOIL’s operations continue to expand we’ve been left with less and less space for team meetings and welcoming potential new customers. It has been SOIL’s hope that in 2018 we’d be able to move our activities to a new, larger depot and we’re excited to share that that’s just what we’re going to do! 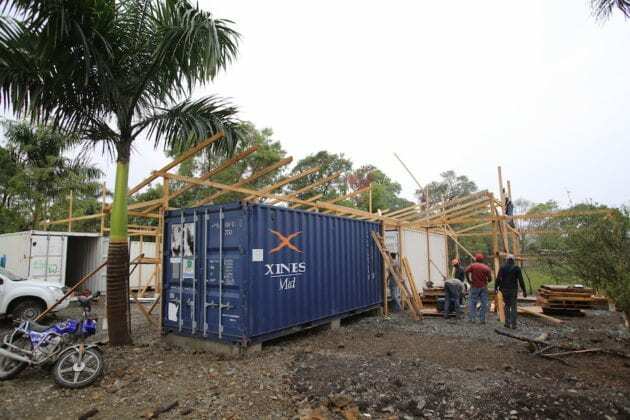 In mid-February, SOIL signed a five-year lease for land and we broke ground last month to build this new depot in Ti Lary, a quiet neighborhood between Cap Haitien and SOIL’s composting site northeast of town. 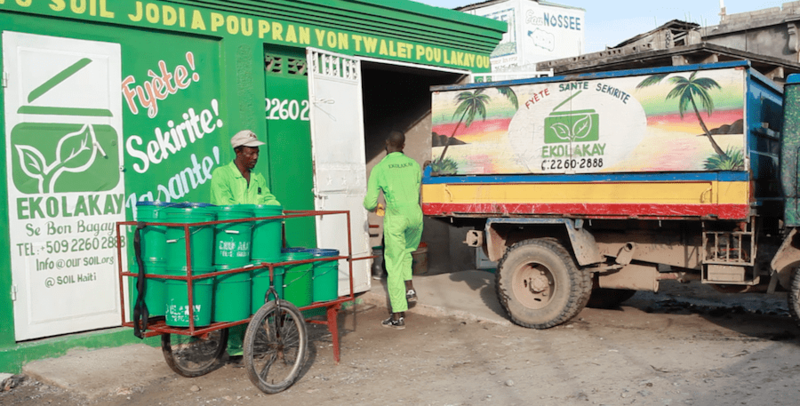 Currently, SOIL’s operational activities for our EkoLakay sanitation service are spread out across multiple sites in and around Cap-Haitien. Once construction of the new site is complete, our new depot will function, even more so, as the central location that houses all of the pieces of SOIL’s operational work, whether that be space for staff meetings, a workshop for toilet construction and maintenance, or space to store materials and vehicles. Beyond the fact that the cost of land in Ti Lary is relatively more affordable than other neighborhoods in the area, another reason that SOIL selected this location is the proximity of Distillerie Ti Lary, SOIL’s current supplier of bagasse. Bagasse is the main ingredient in SOIL’s bonzodè. 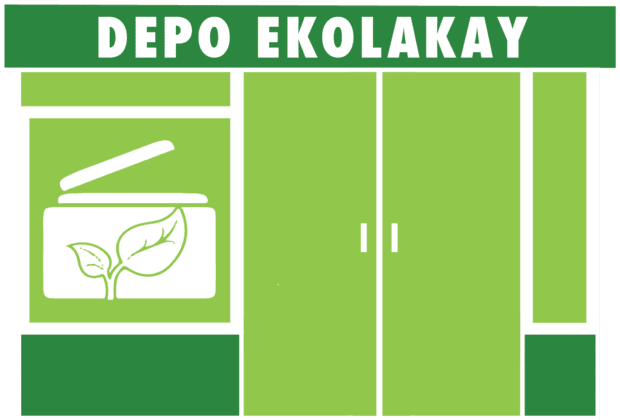 As transportation is currently EkoLakay’s biggest expense, reducing the cost to transport the bagasse to where SOIL will grind and prepare it to before it goes out to households means that we’ll be saving money each and every week. So, what does SOIL need to do to ensure we get this depot up and running? As of now, the ground has been leveled and in the coming weeks we’ll begin by building the workshop for toilet construction. We’ve hired for the construction positions that are necessary to complete the project and will begin the process of hiring for the permanent, full-time positions to ensure SOIL has the staff capacity to run and maintain the new space. At the same time, the EkoLakay team is working hard to strategize so that we can make sure that the logistics of the service will be improved once we move into the depot. Check back to the blog this later this spring for updates from the construction site! 2 Replies to "Building a Depot to Streamline SOIL’s Operations in Northern Haiti"
Your work is outstanding in term of what it is going to do for Haiti sanitation. I was wandering if you have thought longterm how your system would fit when highrise type of accommodation is eventually introduced in Haiti. Thank you for your words of encouragement, Daniel! One of the things that we’re most proud of about our EkoLakay toilet design that we’ve co-created alongside the communities we work is that they work well in nearly any type of shelter or housing. They are portable, durable, and don’t require connection to a water source or sewer line – so we anticipate they would work just as well in a high rise accommodation as they do in the homes where they are used now. Thanks for following along online and for the great question!